Being stuck with a small kitchen is not flattering but that’s the drawback of living in a small apartment. And while you can’t physically expand the space you can do it visually by making the most of your small kitchen. Today we’re looking into some of the ways to make that tiny kitchen look more open and bigger. Here are 14 ideas that are quite easy to implement and the effect they have is significant. You’ll be feeling much better about your kitchen if you use just a couple of them. Lacquered cabinets are our favorite because shiny surfaces bounce the light around and a light room is a visually bigger room. A kitchen runner rug will add visual length to the floor and make it look better. A runner is easily replaced so you can’t really afford not to try this idea. Open shelves don’t add so much visual weight as cabinets, they can use the vertical space more effectively and run around shelves are perfect for a small kitchen. So next time you remodel your kitchen, plan for some open shelves. Direct the eyes vertically with elongated vertical patterns to create a visually higher room. Use patterns on an accent wall or a backsplash. Minimize the visual weight with glass door cabinets. Paint the walls and cabinets the same hue to eliminate the visual blocks. Ornate bulky cabinets add a lot of weight and make the kitchen look cluttered, while straight sleek lines make it look bigger. Yes, you have limited horizontal space but you can still make use of the extra vertical wall space to hang a pot rack. Use stools that can be pushed under the table to save space and not get in the way. Put all unnecessary things away and leave just a few accents and the necessities out in the open. Nothing emphasizes the small kitchen size as clutter. You can use a roller cart as a DIY kitchen island even in a tiny kitchen, it gives you an extra surface and can be moved out of the way when not used. A pullout pantry is a great space saver that makes use of awkward space between the appliances and cabinets. That awkward space above cabinets is rarely used, you can add baskets there for efficient storage in a small kitchen. 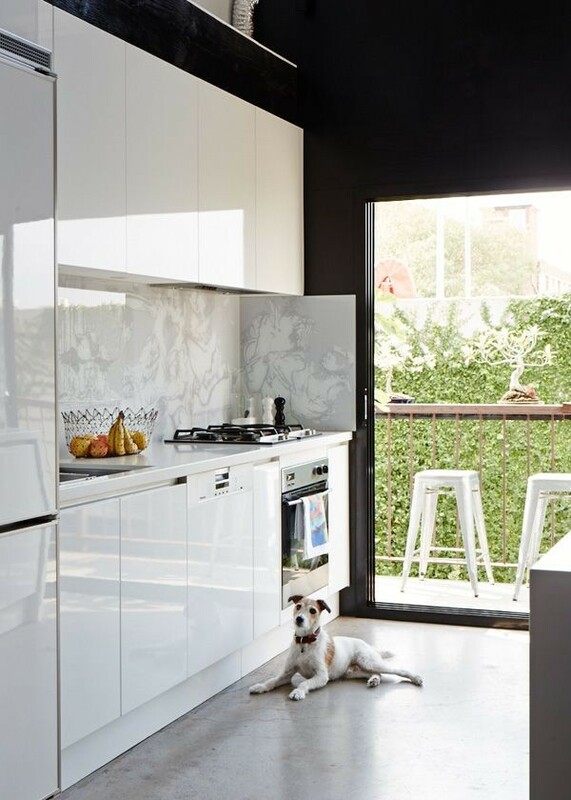 Mirrors can double visual space so use them in the kitchen too. For example, create a mirror backsplash.